When was distillation introduced to Mexico and the Americas? Tequila. There is no other drink that conjures up the mystique and history of Mexico as well as this legendary elixir of the gods. A drink, which comes from a plant, the agave. A plant which has its own goddess and pantheon of drinking gods. Over the past 400 years, tequila has become a symbol of Mexican nationality, pride and culture (Chadwick). However, as Shakespeare would say, aye, there’s the rub – it’s modern. As members of the SCA, we’re not really interested in modern, are we? The question for us then is, could it be period? To properly answer the question posed above we need to know when tequila was first produced and who would have been drinking it. Let’s explore then the origins of this beverage. To do this, we need to understand the plant, its related beverages and the peoples involved. Hernán Cortés, marqués del Valle de Oaxaca (1485-1547) was a Spanish explorer and conquistador. In February 1519, Cortés arrived in Mexico with about 500 soldiers and 100 sailors. By 1524 he had conquered the Aztec empire. He was appointed governor of New Spain by King Charles I of Spain the following year (Bandelier; James). Surprisingly, Filipinos were also involved. They came to Central America with the Spanish and works as laborers on the palm plantations (Colunga-GarcíaMarín 1654-1655). The maguey plant, Agave atrovirens. Photo by the Rodale Institute. As mentioned, tequila and its close relative mescal are derived from the agave (Chadwick). The agave also known as the maguey is a member of the botanical family Agavaceae which includes over 400 species; it resembles a cactus but is related to the families Amaryllidaceae and Liliceae which includes the amaryllis and lily. The agave is a perennial, native to the hot and arid regions of Mexico, South America and the southern United States. Agaves have thick, succulent, often thorn-edged leaves clustered close to the ground and surrounding a single stout base. The plant can range in size from a few inches to over 12 ft. tall and wide. The Blue agave (A. tequilana Weber var. azul), is the variety specifically used for tequila (Chadwick; Colunga-GarcíaMarín 1653-1654, 1656; Maestri). There is extensive archaeological evidence dating back over 12,000 years that foraging groups made extensive use of the maguey for food and fiber. It has also been used for making string and cordage (for nets, hammocks, and rugs), shoes, textiles, paper (for codices), thatching, food, fuel, soap, bandages and snakebite cures (Maestri 1; Zizumbo-Villarreal 289). Before corn [(maize) (Zea mays subsp. mays)] became a staple crop, agave was the main source of carbohydrates for the indigenous peoples of western Mexico and the southeast United States. Agave was prepared by cooking the stems and floral peduncles (quiotes) in stone lined pit ovens. This is critically important, to the subject of tequila, as baking the agave body (piña or pineapple) is a necessary step in the manufacture of tequila. We do know that pit ovens used for food preparation are identical to those used for producing mescal (Colunga-GarcíaMarín 1654; Zizumbo-Villarreal1 289). Two culturally significant alcoholic beverages are produced from the maguey: pulque and mescal. Pulque, was characteristic of central Mexico. The Spanish described the Otomi Indians (thought by some to have discovered the process of making pulque) as a tribe of half -naked barbarians who went about in an intoxicated state brought on by drinking the liquor made from the maguey. Cortes described pulque in his first letter to King Carlos V: “They sell honey emanated from corn that are as sweet as the sugar obtained from a plant they call maguey and from these plants they make wine and sugar which they sell” (Kolendo). Pulque is the fermented, but not distilled sap (aquamiel, “honey water”) of the maguey plant. It is a milky white, somewhat thick, slightly foamy beverage with a sour yeasty flavor of 4-8% alcohol by volume (ABV). Pulque played a significant and complex role in the religious practices of Mesoamerican cultures. There is extensive archaeological, pictorial and written evidence that pulque was known to the Maya and central to their religious beliefs long before their empire rose to power. (“Aztec Empire” 2016; Correa-Ascencio; Lappe-Oliveras). The original name for pulque was iztāc octli, white pulque. The term pulque was probably mistakenly derived by the Spanish from octli poliuhqu(i), which meant “spoiled pulque”. This term may have originated because of pulque’s rapid rate of spoilage. There is debate over the terms linguistic origin. It may derive from the Náhuatl or Mexica languages (“Pulque” 2016, 2013). In the past, Pulque was reserved for the priesthood and religious ceremonies. Over time, it spread to the general population. It became the dominant fermented drink of Mexico until displaced by beer in the 20th century. Pulque also provided an important and inexpensive source of carbohydrates, amino acids, and vitamins (Chadwick). The fermented liquid extracted by roasting the plant’s body (piña or pineapple) was characteristic of western Mexico. Once distilled this beverage becomes mescal. However, it may have also been known as mescal prior to distillation. Indeed, mescal can also refer to the plant and to food made from roasting the plant. The etymology of mescal is from the Nahuatl metl plus ixcalli for cooked-agave and so is not a beverage specific term. We do know that a fermented beverage made from the liquid extracted from the cooked plant was in use by the time of the Spanish conquest, but it is not clear if this beverage always had a separate name. Beginning with our (SCA) period the pre-distillation fermented liquid has been known as mescal-crudo and Tubo. (Tubo was a term also used by the Filipinos for coconut spirits). Other than originating from the same plant, mescal and pulque are not related; as noted above, mescal comes from the roasted plant, while pulque is made from the maguey’s sap (Maestri; Valenzuela-Zapata1). To brew pulque, the nascent flower stalk is scooped out of the ripe piña before it begins to grow. This procedure is known by the unfortunate term “castration.” Castration creates a reservoir in which the sweet liquid sap (aguamiel) collects. The aguamiel is harvested by hand using a long necked gourd (an acocote) and placed in large wooden barrels. Natural fermentation turns it into alcoholic pulque in just a few days. A maguey may produce 5-8 liters of sap per day for about 3-4 months (Lotter; Maestri). Aquamiel collecting in the cavity where the plant was castrated. Photo by Rodale Institute. Pulque does not have a long shelf life. This is commented on in this wonderful quotation from a Spanish traveler in 1552. “There are no dead dogs, nor a bomb, that can clear a path as well as the smell of…. (putrified pulq)” (Carey; Lotter). We can presume from this that the Spanish were certainly familiar with pulque. When I started this project, I was under the mistaken assumption that pulque is distilled to produce Tequila and Mescal. Mescal, also mezcal, is quite likely the first distilled spirit of the Americas. 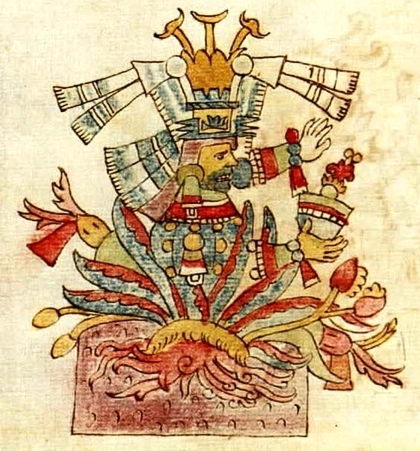 The word derives from the Nahuatl mexcalli ‎(cooked maguey; mezcal) from metl ‎(“maguey”) + a derivation of ixca ‎meaning “to cook, bake, roast” (Chadwick, Colunga-GarcíaMarín). Mezcal is if you will a Spanish-Aztec fusion drink; a mestizo, from the Spanish for mixed, implying that it is a combination of European, Filipino and indigenous traditions; distillation from Europe and the Philippines and maguey from the Aztec (Pint). Mescal can be made from several maguey varieties, whereas tequila is specifically from the Agave tequilana [blue agave (agave azul)]. The cultivars used for pulque are different from those used for either mescal or tequila. Those used to produce pulque, agave pulquero and Agave salmiana (Yetman) are enormous with leaves large enough to cradle an adult (Lotter; Valenzuela-Zapata1). In mezcal and tequila production, the sugary liquid is extracted from the piñas (or hearts) by roasting and then crushing them. This gives rise to a different liquid base than that used for pulque. Thus if one were to distill pulque, it would not be a form of mezcal, but rather a different drink. I have not come across any references to distilled pulque (Chadwick). Stone baking pit with trimmed piñas. Photo by Ian Chadwick. Today name Mescal, like the name Tequila is a protected denominación de orígen. Its production methods, much like Cognac or champagne must meet certain legal requirements. Naturally, this protection and current nomenclature is a modern invention dating to the 19th century (Huhn; “Norma” 2016). To produce mezcal, the sugar-rich heart of the agave, the piña, is placed in a rock-lined pit oven, covered with layers of moist agave-fiber mats and earth and then steam-baked over charcoal for several days. The charcoal is from a wood fire used to heat the pit and helps gives mezcal its distinctive smoky flavor. Baking the agave in a pit oven is one of the primary differences between tequila and mescal. The baking process caramelizes sugars in the plant which contributes to the flavor (Chadwick, Huhn). Piñas baking under a large mat. Photo by David Driscoll. The cooked plants are then cut into pieces and milled into a fibrous pulp (bagazo) with a traditional stone mill (tahona, molino egipcio or molino chileno). The mill may be powered by draft animals, or a machine. In some regions, the baked agave are pounded with wooden mallets rather than processed in a mill. Some feel this produces a better flavor (Huhn). The pulp along with sufficient water is mashed in open air tanks to allow for natural yeast and bacteria to begin the fermentation process (Lappe-Oliveras). The bagazo is sometimes allowed to dry ferment for several days before water is added. According to regional tradition, the vats may be dugout logs, stone pits or wooden vats. Another traditional method was to ferment in cowhide. The end product, musto, is about 5% alcohol. This fermented beverage is also referred to as tubo, a Filipino term referring to distilled coconut spirits. Interestingly, this is an historic anachronism which hints at the origins of distillation in Mexico. I’ll discuss this further in the section on the history of distillation in Mexico below (Huhn; “Mezcal” 2016, Pint). The term tequila derives from the town of Tequila in Jalisco, Mexico, famous for producing this style of mescal. The word itself derives from Nahuatl Tequillan, Tecuila meaning place of tribute (James). Tequila is a type of mescal, but mescal is not tequila. The term is a protected Appellation of Origin in accordance with the Norma Oficial Mexicana and the Tequila Regulatory Council (“Norma” 2016). As with the relationship of cognac to brandy or champagne to sparkling wine, the term is region, species and technique specific. Tequila is a modern term first used in 1875. Previously, tequila was simply vino-mescal de tequila (Chadwick; Colunga-GarcíaMarín). Agave processing for tequila is similar to mescal production. There are however some differences. The agave are split then baked in above ground ovens rather than left whole and cooked in stone pits under wet fiber mats and charcoal. Modern ovens use pressurized steam. Before the late 19th century this process was similar to the pit cooking used for mescal; deforestation from the increasing demand for tequila led to the innovation of above ground gas and coal fired heating. A low heat is used to prevent caramelization of the sugars (Chadwick; James). Traditional ovens (horno) are stone or brick-lined. Modern ovens are stainless steel autoclaves. Cooking the agave is a required step for both tequila and mescal. The heat transforms the agave’s natural carbohydrates and starches into fermentable sugars. This is analogous to mashing barley grains in order to brew beer. As with mescal, initial fermentation takes place in open air vats exposing the musto to natural yeasts and the bacteria Zymomonas mobilis which lives on the skin of the agave plants (Correa-Ascencio; Lappe-Oliveras). Zymomonas species are perhaps the most important alcoholic fermenters of the bacterial world. They are found in sugar rich plant saps and juices, and are integral to the fermentation of agave (Correa-Ascencio; Lappe-Oliveras). Tequila is a distilled beverage. To answer our question we need to know when distillation began in this area. There is no archaeological or written evidence of distillation in West Central Mexico or the Americas prior to European contact in the 16th Century. Mexican wines made from maguey (not pulque), hog-plum, maize, and cactus pears are documented by the Spanish by 1580 (Zizumbo-Villareal2 414). The prevailing thought is that distillation was introduced by Filipino sailors and workers who arrived in West Central Mexico with the Spanish via the “Manila Galleon” trade (1565–1815). Other researchers suggest agave distillation began in the 17th century through adaptation of the sugarcane rum model using the Arab style still introduced by the Spanish. Finally, there is a hypothesis for pre-Spanish distillation of agave (Colunga-GarcíaMarín 1654-1655; Valenzuela-Zapata2; Zizumbo-Villareal3 494, 499). Filipinos were brought in by the Spaniards around 1570 and were primarily occupied with coconut cultivation and production of vino de cocos. This term is somewhat vague and may refer to a fermented coconut wine. However, in addition to the quote above, there is a 1612 reference to vino de cocos which states “ it is incorrect to call it vino de cocos because in reality it is spirits … and to obtain it requires skill, a still and lots of work.” Another source from 1612 notes that large quantities of coconut spirits (232,000 liters annually by 1612) had been made for the past twelve years, whereas before that, very little was made (Colunga-GarcíaMarín 1654-1655, 1665; Zizumbo-Villareal3 499-500). A clay pot still. Photo by Alvin Starkman. The stills used today to produce mescal remain similar to the stills used in Mexico and the Philippines by 16th and 17th century Filipinos to produce coconut spirits. Historically the stills were made from hollow tree trunks or pottery and were quite primitive in construction (Bourke). Today of course some producers use more modern stainless steel stills or copper alembics. The type used will affect the final flavor (Pint; Valenzuela-Zapata2, Zizumbo-Villarreal3). Initially distillation was limited to coconut spirits. This is understandable given that this is what was familiar to the Filipinos. Coconuts were introduced to western Mexico in 1569 although it may also have been brought in as early as 1539. The first documentation for a producing coconut plantation occurs in 1577. In that year Francisco Hernández records that there are two types of palm, one for fruit and one good for spirits (Zizumbo-Villareal3 499-500). Coconut cultivation expanded rapidly which necessitated the incorporation of native Mexican workers (Zizumbo-Villareal3 500). The Filipino still technology was more easily adapted to local resources than the more elaborate and difficult to reproduce Spanish style alembic (of Arabic origin, also introduced by the Spanish). The Filipino still was also more easily disassembled which in turn kept mescal alive during the following centuries despite the prohibitions, fines and persecution enacted by the authorities. The Spanish did not want the domestic product competing with imported wines. This type of still continues to be used for mescal production (Bourke; Colunga-GarcíaMarín 1664-1665; Zizumbo-Villareal3 500-501). Because of competition with imported Spanish spirits, prohibitions and restrictions on the sale of coconut spirits were enacted as early as 1603. In 1612 coconut, plantations in Colima were ordered destroyed for the same reasons. This could be taken as a hint as to how productive this industry had become. Interestingly there is speculation that the combination of legal restrictions and prohibitions of coconut spirits combined with increased demand in growing mining areas may have promoted production of agave spirits, i.e. mescal, through adaptation of the Filipino coconut distillation technique (Colunga-GarcíaMarín 1660; Zizumbo-Villareal3 501, 506-507). Although the first written documentation of mescal appears in 1619, there is ethnohistoric and archaeological evidence that both coconut and agave spirits may have developed simultaneously near Ixtalhuacán, Comala, and Nahualapa Mexico around 1580-1600 (Zizumbo-Villareal3 498-499, 501-502). At this time distillation in western Mesoamerica prior to European contact remains conjectural and controversial. There is extensive documentation of various fermented beverages in Pre-contact codices. There is no evidence however for distillation. The hypothesis is based on the physical similarity of early Chinese stills to early Capacha era bean pots and steamers (c1500-1000 BCE) from Colima (western Mexico). It does not appear that researchers are proposing cross cultural technology transfer in that period. Rather, they are noting the similarity of the Colima vessels to the Chinese still. This could simply be a case of similar needs resulting in independent development of similar technologies. They do suggest that the native Chinese bean pot/steamer vessel which were characteristic cooking vessels during the Shang and Zhou periods (1600-221 BCE) was the probable origin for the Chinese still as well (Zizumbo-Villareal2 414-415). (A) Trifid vessel and miniature pot from the Capacha cultural phase (1500–1000 BCE) of Colima, Mexico that could be used as a recipient, on display in the Regional Museum of Guadalajara. (B) Gourd-shape vessel from El Pantano culture (1000–800 BCE) of Jalisco, that could be used as a steamer, on display in the Archaeological Museum of Mascota. Photos by the respective museums. Distilling requires a means for separating ethanol from water by exploiting ethanol ’ s lower boiling point (78.4°C vs. water’s 100°C). Thus setting a small catch basin on the grating of a Chinese steamer or in the center of the upper portion of a Capacha vessel with a bowl of cold water over the mouth of the vessel above it would mimics the arrangement of a Chinese still. The alcohol containing steam from the heated low alcohol liquid rises condenses on the undersurface of the cool water filled bowl and drips into the catch bowl below. Alcohol having a lower boiling point than water, this process will produce a higher alcohol distillate. Interestingly, researchers in Mexico were able to distill agave spirits with an ABV of 12-32% using reproduction bean pots and steamer pots. Although plausible, the reality of Pre-contact distillation remains an intriguing but unproven hypothesis (Zizumbo-Villareal3 419-422). So then, what are we to say our faithful Scadian who wishes to remain in period? He may certainly enjoy a frothy mug of Pulque. This was a drink well known to and often commented on by the Spanish. Our faithful Spanish cleric can slake his thirst on coconut spirits as we have evidence that this was in production as early as 1577 and causing trouble for the authorities by 1603. Unfortunately, the earliest written evidence for agave distillation dates to 1619. However, there is hope. There is always hope. First, some say our period ends in 1650 in which case, mescal is comfortably late period. Others can place their hopes on the supposition that agave distillation quite plausibly occurred simultaneously with coconut distillation as early as 1577. In this case mescal falls into standard definition for SCA period. Tequila however did not arrive on the scene until the mid nineteenth century. Granted, it is a subdivision of mescal, but it cannot be considered as an SCA period beverage. “Aztec Empire.” Wikipedia: The Free Encyclopedia. Wikimedia Foundation, Inc. 21 July 2016. Web July 2016. Bandelier, Adolph Francis. “Hernando Cortés.” The Catholic Encyclopedia. Vol. 4. New York: Robert Appleton Company, 1908. Web. 27 July 2016 from New Advent. Accessed July 2016. Huhn, Axll; Dallman, Nils. Production. Mezcaleria. Web. July 2016. Kolendo, Jan. The Agave: a plant and its story, part 1. 2002. Web. July 2016. Lotter, Don. Pulque: Mexico’s unique and vanishing drink. PAN-AMERICAN ADVENTURE: Tepotzotlán, Mexico. Rodale Institute. “Mezcal.” Memidex. Free Online Dictionary/Thesaurus 2013 . Web. December 2016. “Norma Oficial Mexicana.” Wikipedia: The Free Encyclopedia. Wikimedia Foundation, Inc. 5 November 2015. Web. July 2016. Pint, John. Did Tequila Originate in Colima. 2016. Web. July 2016. (1) Valenzuela-Zapata, Ana G.; Nabhan, Gary Paul. (2004) Tequila: A Natural and Cultural History. The University of Arizona Press. (2) Valenzuela-Zapata, A. G., Buell, P. D., “Huichol” Stills: A Century of Anthropology – Technology Transfer and Innovation (2013) Crossroads, 8, 157-191. “What is the SCA.” Society for Creative Anachronism Newcomers Portal. Society for Creative Anachronism. Web. June 2016.